On Saturday, December 3, the community will come together for the annual Holiday Parade of Lights, with the 2016 theme, Do You Hear What I Hear? This year’s town-wide event is packed with exciting activities for the whole family, including a special visit from reindeer and Percheron horses, from 3 to 6pm in Sandstone Park, a lively parade through Town, beginning at 6:30pm, and a spectacular fireworks display at the close of the parade. Following the fireworks show, Sandstone Park will host live music, Mr. and Mrs. Claus, and the highly anticipated Parade Awards Ceremony. 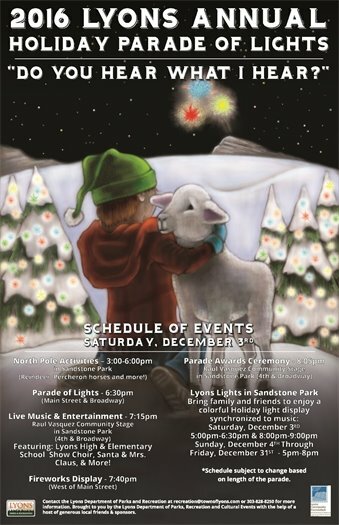 A panel of judges will award the outstanding parade entries in the categories of “Best Use of Lights,” Best Representation of Theme,” and “Overall Parade Winner,” along with winners from each entry type. Sign up! This grand holiday welcome wouldn’t be complete without the bright glow of Lyons’ notable light show. Colorful, captivating, and synchronized to music, the Lights in Sandstone Park is long-standing community favorite. The 160,000-light production – complete with a 11,200-light mega tree –will debut at 5pm on December 3, and illuminate Sandstone Park each night, through December 31. 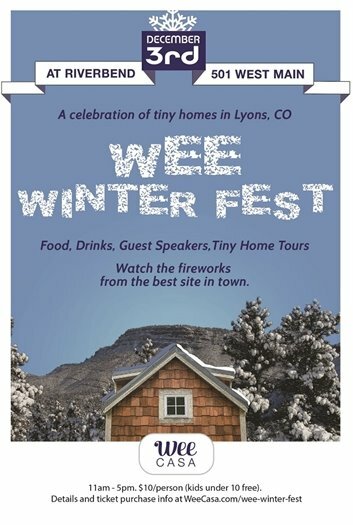 All are invited to ring in the holiday season with dancing lights, fireworks, and celebration of community togetherness in the glowing town of Lyons, Colorado! If you are interested in entering the parade, or would like to donate money or time to this event, the donation & entry forms can be found here. Please direct questions to 303-823-8250, or email recreation@townoflyons.com. Please read the following notices regarding parking, parade routes, and traffic impacts of the Holiday Parade of Lights, taking place Saturday, December 3. The parade will route through Main Street, a portion of Hwy 7, Broadway and exiting onto 3rd Avenue. Cars will not be permitted to park on these roads between the hours of 4:00 p.m. and 9:00 p.m. on Saturday, December 3, 2016. Vehicles may be towed at owner’s expense if you are parked in a no parking parade route area between these times. Parking will be available in Bohn Park, the RTD Parking Lot and side streets on the north end of town. Spectators should view the parade from the sidewalk areas and should not be in the street while the parade is in session. Please note that the staging area, downtown area and parade routes will impede traffic and cause delays for motorists. Those in Town may not be able to exit until parade has completed. Staging for the parade entries will take place on 2nd Ave. between Railroad and Park, on Evans between 2nd and 3rd, and on Hwy 66 between 2nd Ave and Park St. 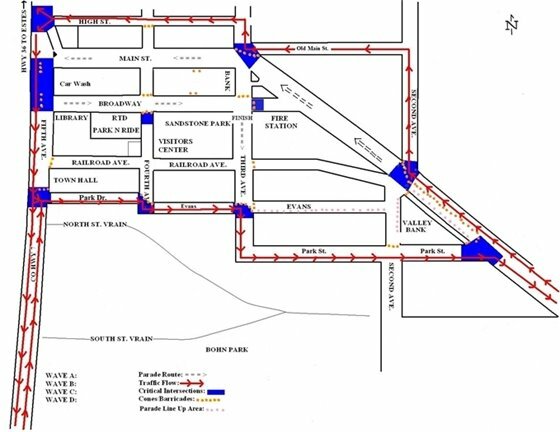 Please see the attached map of the parade route, through traffic flow, and staging area. Please be aware of your surroundings while the parade is passing and please be sure to keep an eye on all children during the event should items such as candy be thrown by any parade entries (although strictly against parade rules). Thank you for your cooperation in this matter! For more information, please contact Lyons Parks & Recreation at 303-823-8250. Mark your calendar! 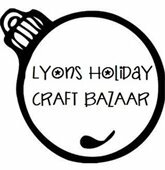 60 + artists, crafters, and foodies will sell their handmade wares in the Lyons Elementary School Gym at the 42nd Annual Lyons Holiday Craft Bazaar! This year’s Bazaar is Saturday, Dec. 3rd from 10am-5pm and Sunday, Dec. 4th from 11am-4pm. A wide variety of quality crafts, jewelry, photography, pottery, glass, and textile arts are found for sale at this eclectic event. What’s more, it’s a great opportunity to find unique holiday gifts and accessories. Last year thousands of shoppers attended. This is a Lyons-area tradition not to be missed!